What would your reaction be if an NBA MVP and scoring champion elected to join your team via free agency? As any Warriors’ fan, my first reaction was pure ecstasy on July 4 when I received my barrage of texts about the signing. The oft-cited Bill Simmons expose dissects thoroughly how Warriors fans have been tumultuously thrown around over the course of recent decades. We've all been witness to that roller coaster veering sharply upward in recent years. Now that team represents the league’s Goliath. 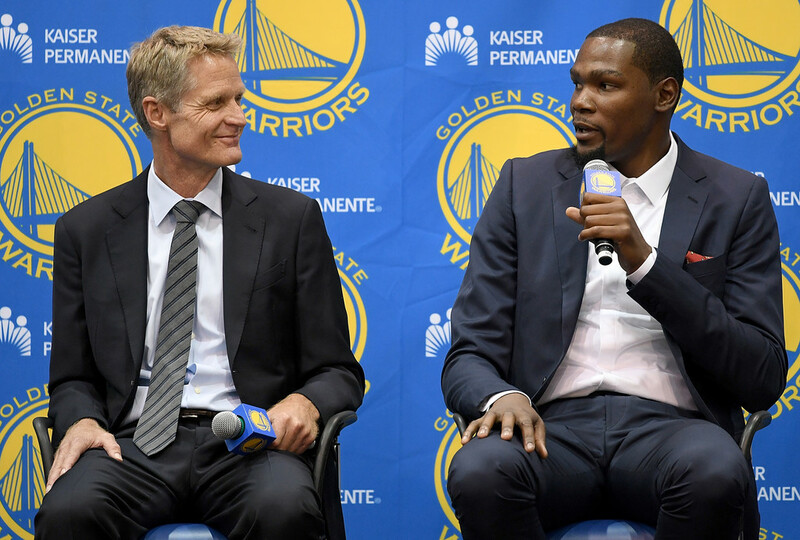 The 2016-17 Golden State Warriors will be one of the league’s most intimidating super-teams. Kevin Durant, Stephen Curry, Draymond Green, Klay Thompson…it is undoubtedly a powerhouse team unlike any in NBA history. It feels ironic that the team from Silicon Valley rose just as meteorically as its tech industry. Apple, Google, Facebook, and Snapchat…and now the local Warriors. The David Lee pick-up set the stage for the Andre Iguodala acquisition which eventually led to this??!! After reading 100s (probably thousands) of tweets, watching too many rants by “experts,” and reading all the hate on reddit and my own Facebook feed, some guilt started to creep in. We earned our championship and our regular season record through the draft, and small but smart moves started to naturally add up. Is Kevin Durant crossing the line of too much? How did Golden State end up ripping the thunder out of Oklahoma City? And where does loyalty fit into the greater picture of the NBA? 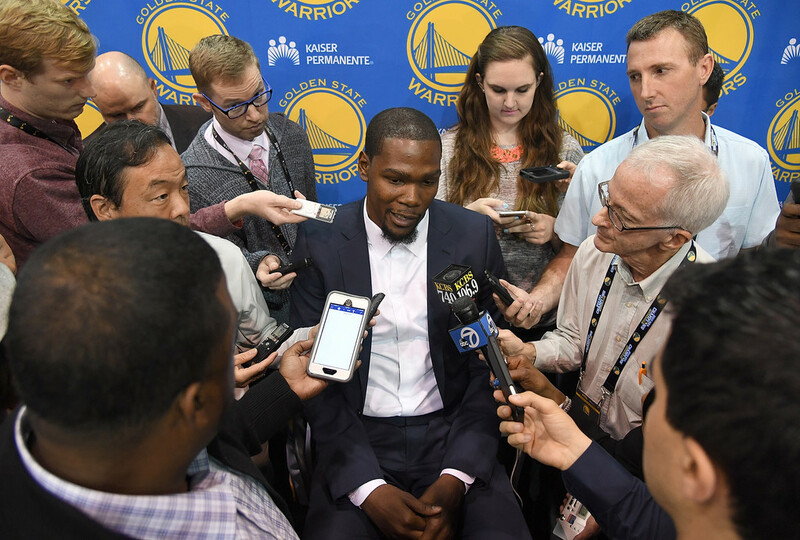 The Warriors should be praised rather than vilified for acquiring Durant. Golden State drafted the vast majority of its core. Stephen Curry (drafted 2009), Klay Thompson (2011), Draymond Green (2012), Harrison Barnes (2012), Festus Ezeli (2012) were all homegrown products. Not unlike Oklahoma City, who drafted three MVP candidates (Kevin Durant, Russell Westbrook, James Harden) in three consecutive years, 2007-2009, both teams relied on strong drafts to make themselves competitive. Isn’t this exactly what teams like the Boston Celtics do? Stack assets, become competitive, and hope to acquire a superstar? The glaring difference between the two teams (GSW and OKC) was their respective desires to retain talent. OKC couldn’t make up a $4 million difference to keep James Harden. They instead opted to take Kevin Martin, Jeremy Lamb, and three draft picks. Harden wanted a $60 million contract; the Thunder stayed firm at $55.5 million (per ESPN). Perhaps it was fitting that, as reported by Royce Young, OKC majority owner Clay Bennett (net worth around $400 million) spent his final weekend courting Durant from a Holiday Inn Express. Warriors majority owner Joe Lacob, by contrast, doled out in 2012 what was at the time a risky $44 million contract to Steph Curry. He took the heat (and boos) for trading away fan favorite Monta Ellis that same year. He paid Klay Thompson and Draymond Green when the time came to do so. The front office hired a general manager with no GM experience (Bob Myers) and paid a coach who had zero coaching experience (Steve Kerr). Both have gone on to win NBA awards at their respective positions. OKC general manager Sam Presti failed to do (among other things) what I recognized and have said since this site’s inception over four years ago: trade Westbrook. Now, in the twisted irony, Westbrook will, in all likelihood, be the last piece of their core to be traded. Presti could never quite get the right surrounding pieces to calm KD and Westbrook in their love-hate relationship. As we have already seen, the hate in that relationship will be highlighted in weeks to come. Despite all of OKC’s success, a cloud of unease always lingered over Chesapeake Arena. Coaching and managerial decisions in OKC's isolation offense made shots a competitive asset. In Golden State's fluid, assist-heavy offense they aren't. One more win in their 2016 season may have relieved that tension enough to sign the pair of superstars to contract extensions, but that win didn’t happen. Where OKC failed, Golden State succeeded. And Durant, after struggling for nine years, wanted a taste of true success. Wouldn’t you? I think it can be universally agreed upon that Kevin Durant had every right to leave Oklahoma City. Even Stephen A. Smith agreed to that. (More on Screamin’ A. later.) The corollary to OKC’s front office failures is that KD had every right to leave. 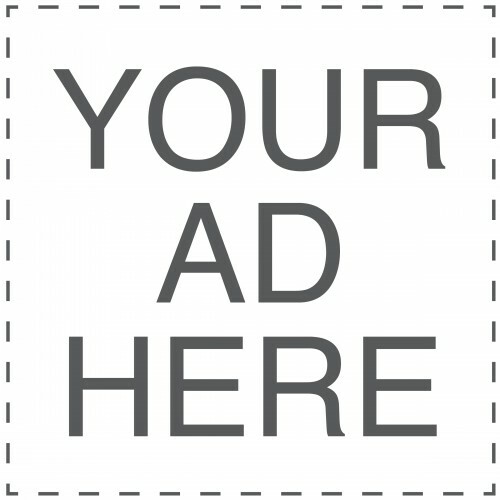 Losing hurts a player’s image, and if one’s image is hurt, so is their brand. The Jordan brand still looms large over the NBA, and there is no doubt that the tech-centric Bay Area would have appeal for Durant, a Nike-sponsored and brand-conscious athlete. I wrote in 2013 that, in part because of the area, Golden State would soon be better than OKC. Who would’ve known that on July 4, 2016, the Bay Area would poach OKC’s once-in-a-generation superstar? This brings us to good old random chance. Injuries happen. Suspensions happen. OKC has had more than their fair share of injury history with Durant and Westbrook over recent years. Golden State never knew if Curry’s ankles would last. The Warriors dealt with both injuries and suspensions in 2016 and didn’t use either as an excuse for losing the NBA Finals. Whether it was Curry going down against the Blazer, Draymond being suspended for Game 5, or Bogut exiting with injury in the Finals, injuries and the unexpected happened. To what degree did it impact the outcome? Who cares. All the theoretical simulations in the world may have ended in a Warriors repeat instead of a Cavs upset, but none of that occurred in the actual 2016 NBA playoffs. There are enough “what ifs?” in NBA history to prove that random chance is ubiquitous. Cleveland Cavaliers fans were just as quick to jump on the excuse train when they lost the 2015 NBA Finals as they were to burn LeBron James’ jersey in 2010. Yet somehow LeBron forgave the city. The city loved LeBron once again. Most impressively, LeBron forgave Cavs owner Dan Gilbert who bashed LeBron as narcissistic, selfish, disloyal, cowardly along with the empty and ultimately false claim that he would bring Cleveland a championship before LeBron earned his first. How many people can say that they willing went back in to work for a boss who publicly shamed them? And the team bounced back in 2016. Once Durant announced he was leaving, the jersey burning insanity reappeared. No loyalty, some fans cried. Nine years apparently means nothing. All of the community work means nothing. The MVP and Finals appearances mean nothing. Kobe Bryant asked to be traded from the Los Angeles Lakers more than a handful of times. In the end, Phil Jackson and Shaquille O’Neal were ousted. Kobe is still praised for loyalty to LA. Derrick Rose was born and raised in Chicago. This off-season, Chicago dealt him away to the New York Knicks. Dwyane Wade is the Heat. He is Miami. Few athletes are the face of their city more than Wade is to Miami. Pat Riley and the Miami mafia were supposed to take care of him. He is now a Chicago Bull on a near-$50 million contract. LeBron James famously departed Cleveland for South Beach. We all know what happened from there. As a San Francisco Giants fan, I also watched All-Star second baseman Jeff Kent leave SF and eventually play for the rival Los Angeles Dodgers. Closer Brian Wilson signed with the Los Angeles Dodgers after being an instrumental part of our 2010 World Series run, the first championship San Francisco baseball had ever seen. What about guys who like Johnny Damon, Roger Clemens, and even Babe Ruth who jumped from one side to the other side of arguably sports most historic rivalry? Let’s revisit the (lack of) loyalty that Oklahoma City showed its own guys. James Harden. Serge Ibaka. Scott Brooks. What about the “original sin” when ownership decided to rip the franchise from Seattle? If a team can’t show loyalty to a city…is there even such a thing as loyalty in sports? Now for the most ridiculous hypocrisy that I’ve seen. Stephen A. Smith had a tantrum over Durant’s decision to bolt David to join Goliath. Yet, like Sporting News wrote, didn’t Smith himself leave a small newspaper to join the “biggest name in sports news”? Charles Barkley also chimed in. (After all, his favorite pastime is ripping anything to do with the Warriors.) Did amnesia kick in when he said Durant is “cheating” to win a title? He demanded a trade from the Suns and ended up with two future Hall of Famers in his own career. Smith and Barkley, in particular, are prone to oversimplification and negligence of facts. They give nice soundbites, yes, but a ten-year-old with a keyboard could write 140-character tweets with the same superficial opinions. Carmelo Anthony gets criticized for taking too much money and not prioritizing winning. Miami will likely be criticized for failing to give a past-his-prime Dwyane Wade his money. LeBron has gone from loved to hated somehow back to loved again by most NBA fans. And unlike Durant, LeBron had a televised decision and a party where he proclaimed “not one, not two, not three…” Somehow, opinion re: the Warriors have gone from “73-9 means nothing because they didn’t win a championship!” to “how is a 73-9 team getting Kevin Durant?? ?” Maybe in light of the lack of consistency in response to stars moving around the NBA, none of this is all that surprising. One of the 2011 NBA Collective Bargaining Agreement's goal was to help small market teams. It backfired when the new TV deal ballooned the salary cap for all 30 teams. If anyone deserves criticism, it’s Adam Silver, NBA owners, and the NBA Players Association for all agreeing to a system that tries to spread talent across the league. Losing the player max contracts could be one way to fix "a broken system." This would force teams to either spend a huge amount on one superstar player or spread the wealth among lower-tier stars. I have a different definition of coward. Men who don't raise their kids, abuse women, take advantage of the poor. People are going to find something wrong when they are on the losing side of a trade or acquisition. Did OKC fail to put themselves in position to keep Durant? Yes. Period. Did the Warriors put themselves in the best position to acquire him? No doubt about it. Was there luck involved? There always is. But to blame Durant and the Warriors for using the system to their advantage is to blame Sam Hinkie for tanking in Philadelphia. It is misplaced blame. Look to those who set the rules of the game to question the “fairness” of the rules; you might be surprised to find that those who agreed to the rules are the same ones complaining about them. Don’t blame the Golden State Warriors who played by the rules and successfully optimized their ultimate goal of winning. Especially when it is a group of guys with character and class. Former NBA commissioner David Stern made a highly scrutinized decision when he vetoed the Chris Paul to the Lakers trade (a trade that I thought should’ve gone through despite having a vested fan-interest in it being vetoed). Conveniently, a Laker fan recently wrote to me that the Kevin Durant to the Warriors trade should have been vetoed just like that Chris Paul trade. I’d be willing to bet he would’ve been just fine if the Lakers had acquired the future Hall of Fame point guard. Khris Middleton, a valuable part of the Milwaukee Bucks backcourt, will be sidelined for six months after sustaining a hamstring injury in pre-season play. Although the Bucks did not have a particularly strong showing to finish out their 2015-16 NBA season, optimism has permeated the organization. The lengthy starting five that the Bucks run, with Giannis Antetokounmpo at point guard, was poised to be a dark-horse playoff contender in the Eastern Conference. Bucks coach Jason Kidd will have to make drastic adjustments to compensate for the loss of their 2016 leading scorer. Scoring 18 points per game with roughly four rebounds and four assists, Middleton was the focal point of Milwaukee’s offense. 44-40-89 shooting splits were also rather impressive for the fourth-year guard out of Texas A&M. At this point, Milwaukee’s ability to compensate will come down on the shoulders of the new $100 million man who apparently took less in order to help mold a solid supporting cast. The wild card is also, of course, rookie Thon Maker. The 7’1” Sudanese-Australian basketball player has already dealt with plenty of media scrutiny during and after the 2016 NBA Draft. His age, 19, was a concern for many franchises who considered drafting him. Perhaps fittingly, it was the lengthy Milwaukee Bucks that took a flier on the teenager. I would be wary before putting any money in online sportsbooks support of the Bucks making a run at the playoffs at this point. 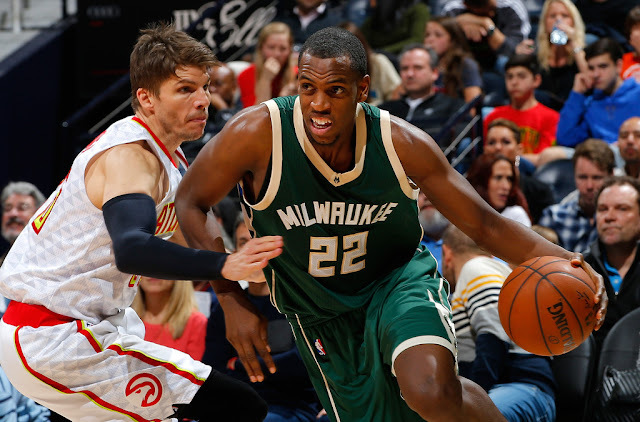 That said, if the odds are significantly dampened by the Khris Middleton injury, it could be worth a shot. 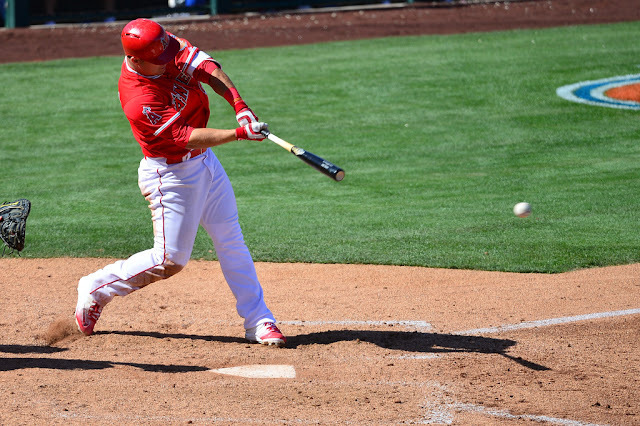 ESPN experts consider Mike Trout as number one player to look out for the 2016 MLB season. He plays for the Los Angeles Angels of Anaheim. Trout was AL Most Valuable Player in 2014. He is a four-time All-Star and a two-time All-Star Game MVP. He leads all players with 37.9 WAR. He can be handy in defense, walks, base running, and durability as well which makes him No. 1 player in 2016 MLB season. ESPN experts think that Bryce Harper can bring intense challenge to Mike Trout. He plays for Washington Nationals and his 2015 stats include .330 BA, 1.109 OPS, 42 HRs, and 99 RBIs. In 2015 season, he became the youngest unanimous MVP in baseball history and was chosen for the 2012 All-Star Game. Harper received the NL Rookie of the Year Award in 2012. ESPN experts believe that Clayton Kershaw is a terrific player and the one to be watched for 2016 season. He plays for the Los Angeles Dodger and his 2015 stats include 33 GS, 16-7, 2.13 ERA, 301 Ks. He is a three-time Cy Young Award winner and the 2014 National League Most Valuable Player. Kershaw has 1,746 strikeouts in 1,611 career innings pitched. ESPN experts trust that Paul Goldschmidt is one of the most important players to look out during 2016 season. He plays for the Arizona Diamondbacks and his 2015 stats include .321 BA, 1.005 OPS, 33 HRs, and 110 RBIs. He is a three-time MLB All-Star and also has attained the National League Hank Aaron Award, Gold Glove Award, and Silver Slugger Award. ESPN experts hope that Andrew McCutchen will be one of the best players in 2016 season. He plays for Pittsburgh Pirates and his 2015 stats include.292 BA, .889 OPS, 23 HRs, and 96 RBIs. He has delivered five straight seasons with 60 or further extra-base hits. He has been chosen for the All-Star Game for the past five seasons (2011-15). You can secure your discount Pittsburgh Pirates tickets from here without service fee and enjoy the live actions of Andrew McCutchen. ESPN experts place Zack Greinke as an important player to watch out during 2016 season. He plays for Arizona Diamondbacks and his 2015 stats include 32 GS, 19-3, 1.66 ERA, and 200 Ks. In 2009, he appeared in the MLB All-Star Game. Greinke g went in front all of baseball with a 1.66 ERA last season. ESPN experts think Josh Donaldson will be a vital player in 2016 season. He plays for Toronto Blue Jays and his 2015 stats include .297 BA, .939 OPS, 41 HRs, and 123 RBIs. Josh was fourth, eighth and first in the past three AL MVP votes. He is powerful with the glove and it makes him a valuable player. As per ESPN experts Giancarlo Stanton will be a main player in 2016 season. He plays for Miami Marlins and his 2015 stats include .265 BA, .952 OPS, 27 HRs, and 67 RBIs. He was chosen to the Major League Baseball All-Star Game in 2012 and 2014. Stanton has hit 181 home runs since he debuted in 2010 and it have come in 2,567 at-bats. ESPN experts see Jake Arrieta as a significant player in 2016 season. He plays for Chicago Cubs and his 2015 stats include 33 GS, 22-6, 1.77 ERA, and 236 Ks. Arrieta won the National League Cy Young Award and was the MLB wins leader. According to ESPN experts Miguel Cabrera is a vital player during 2016 season and he is a most feared and admired hitters in the game. He plays for Detroit Tigers and his 2015 stats include .338 BA, .974 OPS, 18 HRs, and 76 RBIs. He is a two-time AL Most Valuable Player award winner, a four-time AL batting champion, and a ten-time MLB All-Star.